Woot!! I'm getting internet service tomorrow! 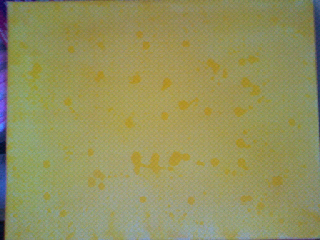 Full post to come, but here is the first and second layer of the Solar Plexus Chakra. This is the 3rd chakra from the bottom. 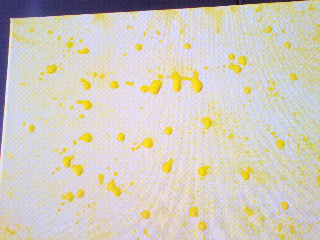 The first layer is fabric ink spray and drops of the ink. I then added water colors to fill in the white spaces. I used yellow and yellow ochre. 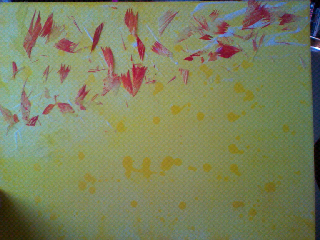 The second, technically 3rd, layer is feathers from a duster I purchased from the dollar store. I then fabric spray inked the tip of the duster red and cut the tips over the canvas. I used liquitex matte medium as glue.